Captain Gonzo will stop at nothing to defeat his arch enemy Kermie Pan. His latest sinister plot involves recruiting the Darling Children and the Lost Boys! 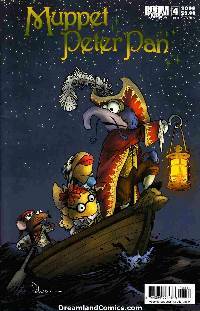 Can Pan convince them that being a pirate isn't fun and adventure on the high seas? Oh, who is he kidding? Being a pirate is a blast-especially when you can shoot your captain out of a cannon! Covers by David Petersen (Mouse Guard) and Amy Mebberson. Most orders ship in 2-4 business days, but please allow up to 14 business days for order processing and delivery time. Free Shipping on any Graphic Novel, Comic or Gaming Book Order over $50.00!